I’ve been wanting to look at different food groups and their benefits for my readers, so enjoy this week and look for good delicious reading in the weeks to come! Fruit! Citrus, berries, avocados. Avocados? Yes, technically, they are a fruit. 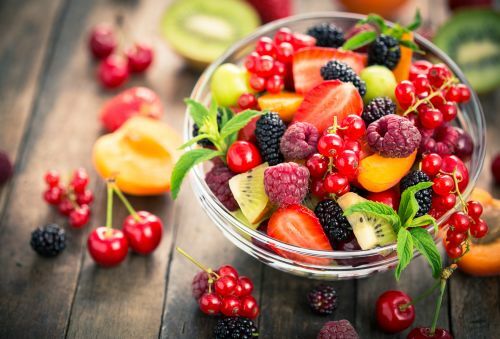 Fruit is good for you anytime of year, but as we wind down from winter and head into spring, fruit can give your immune system a nice boost to adapt to the changing season. Fruits contain so many wonderful things that help us stay healthy! Things like antioxidants, vitamins (especially C and A), flavonoids, carotenoids, limonoids, the list goes on. Fruits and their nutrients are disease fighters. They help us to knock out infections and promote good blood circulation and insulin resistance. An eating plan that includes lots of fruit can help to lower blood pressure. It seems resveratrol, found in darkly colored fruit, like grapes, can help to lower blood pressure as well as blood fats and glucose as it relaxes vascular muscles. Eating fruit, versus drinking fruit juice, provides fiber, which many of us are deficient in. Berries – especially blueberries and strawberries, and raspberries are great as well. Berries help with memory and mental deterioration and really help to prevent almost every major disease! One thing I encourage is buying organically grown strawberries – they are often grown with a lot of pesticides. Bananas – these delicious fruits took a hit during the glycemic and low carb days. Bananas actually have a reasonable amount of natural sugar. Their health promotion outweighs any concerns with sugars for most people. They are great for growing healthy gut bacteria, have lots of potassium, which is good for our heart, and are great for digestive distress. They are cleansing and rejuvenating. If you are concerned about the natural sugars, or like me, like a firmer banana, buy them on the green side. Apples – you know the ole’ saying – “an apple a day keeps the doctor away.” It’s true! Apples have high antioxidant power (the highest of any fruits!) and lots of phytochemicals, which can help prevent colon, prostate and lung cancer. Avocados – yes, technically a fruit. Avocados are high in good-for-you fat – monounsaturated, which actually lowers cholesterol. Plus, the fat is fat from a good, whole food – not a factory. Avocados also contain lutein, which is good for you eyes and skin and they are a great source of fiber! My other favorites include citrus fruits, melons, pineapple, cherries, grapes, dates, figs and prunes. I will admit to not experimenting too much with tropical fruits like guava and mango, but some of that is just my personal taste. I say to you – try a new fruit each week! I freeze berries, bananas, grapes, cherries to throw in my morning smoothie, too – or eat when I’m craving something cold and sweet! Try some fruit this week! To Your Vitality!